This is Gone Ball-istic. As with its companion piece, Life is a Cat-baret, I was inspired here by the long, lean, mousing machines that live with us in rural Colorado. These are individual characters from one of my larger pieces featuring three cats titled Night Moves. Here I’ve sculpted a cat simply having a good time with free-style dance moves. That’s kind of what cats are about. I chose to combine texture with smooth bronze metal here, creating a really nice contrast. The metal texture provides a sense of the fur, while the polished areas give it a little extra bling and interest. You can see many of my style characteristics here, such as whimsy and polished dimensional lines to enhance the sense of motion. 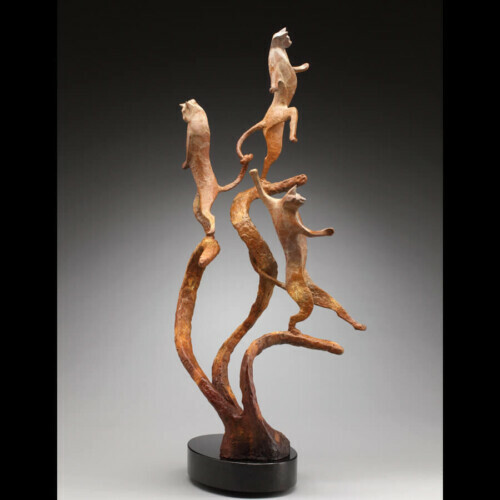 This expressive Limited Edition Bronze Cat Sculpture personifies cats with personality.